If you are going all the way to Antarctica and you can afford a longer trip, it would be a great shame not to visit South Georgia. This island is a wildlife bonanza the Galapagos of the South Atlantic. It is is also packed with history as are the Falkland Islands. 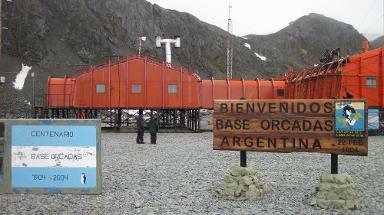 On this trip you also visit the Antarctica Peninsula and can see the associated glaciers and icebergs. A typical itinerary to the Falklands, South Georgia and the Antarctic Peninsula is illustrated below. All itineraries are for guidance only. Programs may vary depending on local ice and weather conditions, the availability of landing sites and opportunities to see wildlife. The final itinerary will be determined by the Expedition Leader on board. Flexibility is paramount for expedition cruises. Day 2: at sea - At sea, in the westerlies the ship is followed by several species of albatrosses, storm petrels, shearwaters and diving petrels. Day 3: Falkland Islands - In the Falkland Islands (Malvinas) we plan to spend the whole day on the fascinating western side of the archipelago. A hike along the Shore of Carcass Island will give us views of Magellanic and Gentoo-Penguins, as well as close encounters with water fowl and Night herons and passerines. 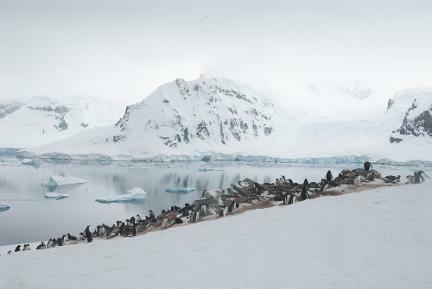 In addition, on Saunders we will be able to observe four species of breeding penguins (Gentoo, King, Magellanic and Rockhopper), Black-browed Albatrosses and King Cormorants. Day 4: Stanley, Falkland Islands - In Stanley, the capital of the Falklands, we can experience Falkland culture, which has some South American characteristics as well as Victorian charm. In Stanley and the surrounding area we can see quite an important number of stranded clippers from a century ago. All passengers are free to wander around on their own. We recommend a visit to the local church and museum (admission fees not included). Days 5 & 6: At sea - On our way to South Georgia we will cross the Antarctic Convergence. Entering Antarctic waters, the temperature may drop significantly in the time span of only a few hours. Near the Convergence we will see a multitude of southern seabirds near the ship; several species of Albatrosses, Shearwaters, Petrels, Prions and Skuas. Days 7 – 10: South Georgia - In the afternoon of day 7 we arrive at our first landing site in South Georgia. 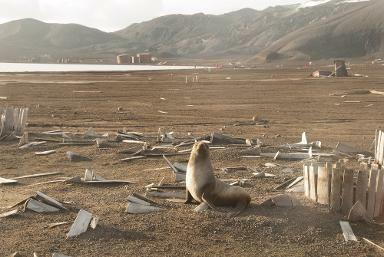 We might visit the bay of Elsehul, with its very active fur seal breeding beach, and then set course to Right Whale Bay, Salisbury Plain, Godthul, St. Andrews Bay, Gold Harbour, Cooper Bay and Drygalski Fjord to give you a good opportunity to see a wide spectrum of landscapes and wildlife, like the Elephant seals, Fur seals, King and Macaroni Penguins. Day 11: At sea - Where the ship is again followed by a multitude of seabirds. At some point we might encounter sea-ice, and it is at the ice-edge where we might have a chance to see some high-Antarctic species like the McCormick Skua and Snow Petrel. Day 12: South Orkney Islands - We are planning on a visit to Orcadas station, an Argentinean base located in the South Orkney Islands. The friendly base personnel will show us their facilities and we can enjoy the wonderful views of the surrounding glaciers. Days 14 – 16 (14 - 17 on voyage PLA29):Antarctic Peninsula – If the icepermits we will sail into the Weddell Sea through the ice-clogged Antarctic Sound. Huge tabular icebergs will announce our arrival to the eastern side of the Antarctic Peninsula. We plan to visit Brown Bluff where we may set foot on the Continent. In good sailing conditions we may decide to extend our time in the Weddell Sea. Days 17 – 18 (day 18 – 19 on voyage PLA29): At sea - On our way north we are again followed by a great selection of seabirds while crossing the Drake Passage. Day 19 (day 20 on voyage PLA29): Ushuaia - We arrive in the morning in Ushuaia and disembark.